Before I began brewing my own kombucha, I used to spend up to $5 per bottle. Just one bottle per day can really add up! Enter the most deliciously simple home brewed kombucha recipe. Prepare to have your mind blown. For those who haven’t tried it, kombucha is a fermented tea that’s full of delightful, delicious probiotics. Forget all those expensive supplements. Try kombucha instead! This drink is especially beneficial if you’ve recently taken antibiotics. It will help replace the good bacteria in your system. I first began drinking kombucha about six years ago during a period of abstaining from alcohol. Because it is fermented, kombucha tastes a bit like champagne, or a mix between soda and beer. It’s awesome! There are so many flavor options to experiment with. Today, I’ll show you how to brew the basic tea recipe, so you can avoid spending upwards of $5 a bottle for this stuff!! There are a few different methods to brew kombucha. I will show you the method I use- which is a continuous brew cycle. Kombucha is made from sweet tea and a colony of bacteria and yeast called a SCOBY (symbiotic colony of bacteria and yeast). It sounds gross, but it’s not!! If you can’t find a scoby for purchase at your local health food store, they are available online. You could also place an ad online looking for one. Every time a batch of kombucha is brewed, another mother scoby is produced. People who brew regularly will always have a scoby to spare. Pretty soon, that will be you! Be sure to pass along this kombucha recipe so all your friends can join in on the fun. The bottles must have flip-top airtight lids if you want a fizzy beverage! Use only plain green or plain black tea (no Earl Grey). The oils in other flavored teas can harm your scoby. Your gallon jar must have a plastic spigot. Your scoby hates metal! Also, be sure to keep your brewed kombucha and scoby covered until ready for use to protect them from fruit flies and other contaminants. Be careful when handling your scoby. Make sure your hands are clean, but give them a rinse with vinegar if you wash your hands with anti-bacterial soap. Since your scoby is made of bacteria, the soap is VERY bad for it. They are sensitive little suckers, but once you get the scoby in the jar and start brewing, you rarely have to handle it. 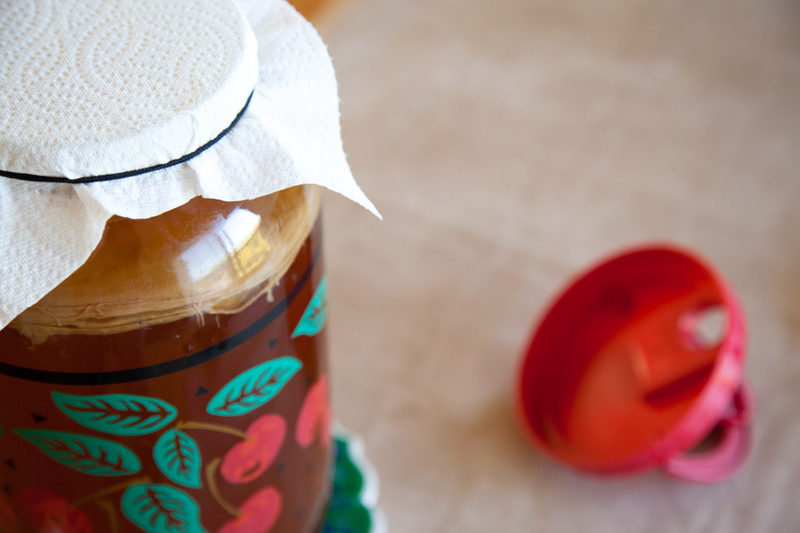 Pour a cup of brewed kombucha into the jar over your scoby. It just fill about an 1/8 of the container. Rinse your pot out with a swish of vinegar before using to get rid of any potential contaminants or leftover soap, then fill with water and bring to a boil. Once the water has reached a boil, drop in your teabags and turn off the heat. I generally use a combination of green and black, but it works well with either or both. Pour your sugar in and stir it until is dissolves. You may use a metal spoon here, as there is no scoby in the pot. Let the tea bags steep until the liquid comes to room temperature. Hot water can.. you guessed it.. harm the scoby. To speed up the cooling process, add cool filtered water. When it’s reached room temperature, carefully move your pot to the sink and fish out your teabags. Make sure your hands are clean and have no soap residue on them. Squeeze the tea bags out over the pot (waste not!) Discard your teabags. (You can use them for compost as well) Next, place your jar in the sink. Empty the tea into the jar. It’s ok if a little spills out. It’s quite concentrated. If the jar is not full, top it off with filtered water. You can use the lid, but make sure to leave the tab open. The fermentation process produces gas, which needs to be released. Cover the opening loosely with a piece of paper towel to prevent fruit flies from getting in. They love this stuff!! Now find a place on your counter for the kombucha to live while it brews. The warmer it is, the faster it will brew. During the summer, I’ve had batches brew as quickly as 2 days. In the colder months, it can take up to a full week. Begin tasting your kombucha after 2-3 days. Once it reaches your desired sweetness, it is ready for bottling. Be careful not to let it sit for too long! It will become quite vinegar-y. TIP- If you want to brew your kombucha more quickly, remove the lid and cover the top with a paper towel and rubber band. The increased oxygen exposure speeds up the fermentation process. Sometimes, if I’m brewing kombucha faster than I can drink it, or I’m super busy with work, I want it to brew slowly. Other times (like now!) I want it to brew quickly. Stay tuned for Pt. 2 of this Kombucha Recipe, where I will introduce new flavors and go into bottling process, which is where it becomes fizzy and champagne-like. Yum!